This weekend as I was just coming out of my Thanksgiving food coma I saw an email in my inbox from one of my favorite radio shows, Family Life Today encouraging their listeners to "Put CHRIST back in CHRISTmas this weekend". They were having a special sale on ornaments aimed at helping you share the story of CHRISTmas. It was a very simple email centered around promoting their sales however the title of the email caught my eye. This truly has been my heart for some time now and it really goes beyond holidays to our daily lifestyle. How are you living and are the ways of this world overshadowing what you truly believe? I feel challenged to go out of my way to make sure my husband and I do not reduce this wonderful Christmas season to just gifts, food and paid time off work. Our goal as a family is to honor and thank God for the gift of his son Jesus Christ, celebrate the gift of Christ as a family and share that same gift with others. Yes we will also eat some good food and give one another presents but that's not the point. I really want to challenge you as well to take a moment and consider your Christmas traditions, is Christ at the center? And if not will you realign? For my family, it's just the two of us for now but I want to make sure we set the right foundation with Christ as our center. This time of year can be overwhelming because of the pressure from outside forces to spend a lot of money on gifts for those you love to show you care. I know I have had to shift my thinking to that of the following, if I didn't give or receive any gifts it doesn't mean that I love or am loved any less. Aside from changing my perspective I am also setting a budget for gifts. As well as asking people what could I give or do that would be a blessing to them this year. Maybe they don't need a new sweater or prepackaged lotion set, maybe a gas gift card would help them more or maybe just maybe they just want to spend some quality time with you. Lastly don't get caught up in setting a tradition or keeping it. The most important thing is to honor God, remember the reason for the season and have fun! Below are a few ways that my family plans to celebrate Christmas with Christ at the center. Spend time reading the Christmas Story aka The Nativity Story as a family and discuss what you read. Did anything new stand out? During this season we tend to focus on all the food but give up a meal and spend that time praying for those who are less fortunate. Make a Cake for Jesus and sing Happy Birthday on Christmas. 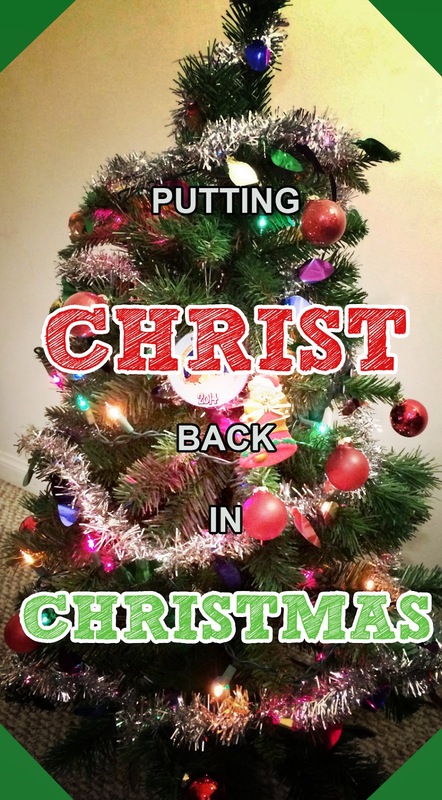 Please feel free to share ways your family will be putting CHRIST back in Christmas in the comments.